All EPF members who have activated their Universal Account Number (UAN) and have also seeded their Aadhaar-linked KYC with EPFO will be able to apply for PF final settlement (Form19), pension withdrawal benefit (Form10-C) and PF part withdrawal (Form31) from their UAN interface directly. The three forms – Form 19, Form 31, and Form 10-C — together form more than 80 percent of EPFO’s claim workload. Throughout the online process, EPF members can make claims directly. The members neither need to interact with the employer, nor with the EPFO field office to submit the online claim. Any claim submitted by the member will flow in soft form to EPFO database where it will be processed and then the member’s bank account will get credited. The government’s e-gov initiatives have made the process very easy. Now members do not require to give any supporting document while preferring online PF Part withdrawal case. Also, members applying online have to give their self-declaration for preferring to make advance claim. For availing this facility, members need to have an activated Universal Account Number. The activated UAN should have an updated mobile number in working condition. All the EPF members’ Aadhaar details have to be mentioned in EPFO database and one should also avail the OTP-based facility for verifying their eKYC from UIDAI while submitting their online claims. Members bank account along with IFSC code, PAN needs to be mentioned in the EPFO database for PF final settlement claims in case your service is less than 5 years. For online claim submission, the EPF members have to login to the member interface using their UAN credentials. The KYC and service eligibility condition mentioned against UAN is to be mentioned correctly and in a complete manner. The relevant online claim can be selected and authenticated using OTP received against the registered mobile number with UIDAI to complete the online claim submission. 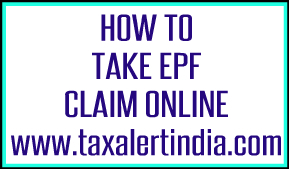 EPF members who want to apply online are required to authenticate their claim submission using OTP sent to their registered mobile number giving consent to UIDAI to share their Aadhaar based e-KYC credentials to EPFO. You need to login to the member interface using UAN credentials. You have to check that KYC and service shown against his UAN are correct or not. You then have to select the relevant claim. Finally, you need to authenticate the process using Aadhaar credentials. The whole facility is expected to ease out the claim submission process for EPF members so as to reduce the turnaround time.